In the world we live in today, we tend to accept things for the way they are without ever really questioning how they came to be. Which came first? The chicken or the egg? Since the beginnning mankind has always wanted to fly but unfortunately gravity has served as a relentless ball and chain that held us down in such times. There had to be a way around it! The concept of falling from the sky dates as far back as the 1100's in China when the Chinese would do what today we call "base jumping"; jumping from cliffs or outcroppings floating to the ground in makeshift parachutes. 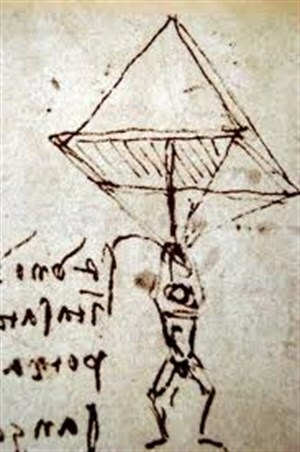 Later in 1485 the renowned Leonardo DaVinci sketched the blueprints for the first parachute. It was five hundred and fifteen years later, on the 26th June 2000 that Adrian Nicholas made an exact replica of DaVinci’s model and had a successful landing. The parachute weighed 187 pounds and was made of rope, canvas, and wood. However, the 10,000 foot jump consisted of Nicholas cutting away at 7,000 feet and using a regular parachute to complete his journey to the ground. The actual history of skydiving starts with french man Andre-Jacques Garnerin, who made successful parachute descents in 1797 using a canvas canopy and a small basket tied beneath a hot air balloon. The first recorded free fall jump is credited to Leslie Irvin in 1919 and the earliest competitive dives date back to the 1930's. Skydiving became much more mainstream once the military began developing parachute technology and used the act of skydiving as a tactical move during World War II. After the war skydiving became much more popular as many returning soldiers took it up and had regular competitions, which led to it becoming a national sport in 1952. Our Chief Instructor will be able to tell you all about that if you would like to know more! The highest recorded skydive in history happened recently, on October 14th, 2012, when 43 year old Austrian skydiver Felix Baumgartner successfully jumped from 39 kilometers, literally jumping from the edge of space. He is the first person to break the sound barrier without vehicular power on his descent. His achievement was broadcast on national television and entered into the Guinness Book of World Records. What a guy!